My 1-year-old just discovered the fun of riding piggyback on Daddy—and has since been demanding rides like I’m a pony at the fair. Which is why the Piggyback Rider has captured my attention of late. The Piggyback Rider ($79) consists of a pair of shoulder straps worn by the parental pony of choice, which are then attached to a stiff foot bar that hangs down the back. The child stands on the bar and grabs a pair of small handholds sewn into the shoulder straps, thus keeping the parent’s hands free. 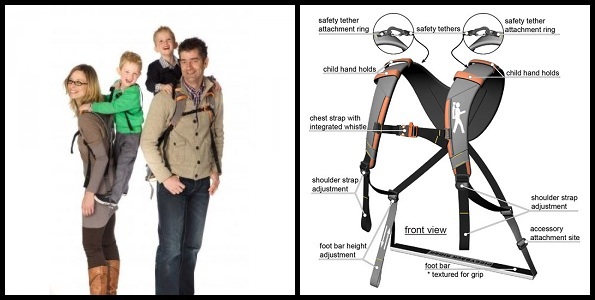 For younger riders, parents can purchase an optional child safety harness ($15), which clips into the small handholds and safely tethers the kid. The Piggyback Rider is designed to support a child up to 60 pounds and the foot bar can be adjusted up or down to accommodate various heights (though I wonder how comfortable it is to carry 60 pounds on your back without any sort of waistbelt support). It’s recommended for children age 2 1/2 and up, which means I’ll have to wait a bit before my personal pony show can accessorize with it. The whole system weighs less than 3 pounds and rolls up to compact, easily toted size when not in use. It is produced by Full Sail International, a small family-owned business based in Bethesda, Maryland.